Remember the story of *Hisham and the Red Balloon, and how I promised to write about the balloon fest one day? Now, I must admit I have always had a fear of popping balloons. I would be the first to run whenever some sadist of a person decides to include ‘sit on a balloon till it bursts’ in some telematch or party game…Nevermind sit on it, if someone were to do it in front of me also, I will be running! Even when I get admitted into the hospital (sorry lar, I had very naughty tonsils), and people will insist on bringing all kinds of fruits and all the things I cannot eat (sick lar wei! ), I wish I could just say: Aiyo, go buy me one of those balloons. Being a bunch of erm, penganggur’s, we could not afford to buy those super expensive balloons. And you have to remember that we had to prepare a total of at least 100 balloons to cater for all the children! It was Yean Mei’s sudden inspiration of buying from wholesale distributors that we managed to buy within our budget…In fact, on hearing about our plans, the shop keeper, bless his soul, even offered to sponsor the sticks (we could not afford to pump helium into the balloons to let them float, so we needed to use sticks to keep them upright! ), as his donation! And then we hit a little snag…I found that the more balloons I blew, the redder my face had become. If that was not all, my lips were stinging very badly and puffing up. As it turns out, my face was somewhat sensitive to latex. And the most ironic thing? There was no anti-histamine in the hospital wards! I needed to go to the pharmacy to get pills…I had to settle for warm water, and continue blowing with the pump…In the end, I just did all the attaching of balloons to the stick for the rest. And yet another problem...How to get the handfuls of balloons into the lift? 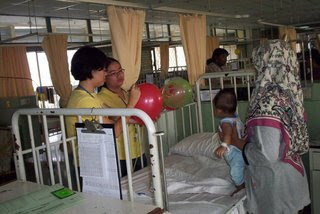 The first ward was Hisham’s ward, Ward 5D…Ward 5D is the Pediatric Surgical Ward. We visited each bed, and wrote the names of each child on his/her balloon, with thick marker. Every sibling too, if around, got one each. Some parents also asked for the children they had at home! Needless to say, Daphne here ran for her life! By the time we were done, our hands were aching, and we were already drenched in sweat. Anyone care to join us? After all, more people means more budget, which means better balloons! I have come back from my short vacation and it's back to routine. Looks like I have a lot of reading to catch up with. What a sweet thing you and Yean Mei did. I'm not surprised you two are best friends if you both have the same heart. And both wearing yellow! How sweet this world will be if there are more like the both of you. Remember to tell us about the next balloon fest ok? First time here. Great job the both of you! I have always liked balloons too and even when I had my baby, I wanted balloons. How I wished when my daughter was admitted to the hosptial some people had thought of bringing cheer to the ward, in whatever way. Mostly they will only come if there is a celebration like Hari Raya and then they will come with reporters. That;s why it's a great thing when people especially people so yougn like you and Yean Mei do things like this just because you want to. ok, call me paranoid for all i care and no offence to him but y wld a security guard wants a balloon for? in the wake of what has been happening lately, i dread thinking what a balloon cld do in luring young kids. i'm not being overly-paranoid, am i, daph? Oh, and remind me never to go near you when there's a balloon in sight! Thanks for coming back, by the way! Oh No! Another balloon-bursting kaki? How can somebody so sweet and petite like you inflict so much harm? hv a great weekend Daphne! Yay-yay! I found someone who is afraid of popping balloons! "kids and balloons are like bees to honi", huh? You have a great week too Pooh Bear! told u i'm paranoid! God help me. Tahnks for posting, very good. Its nice to know there are people out there who goes out of their way to help lighten up others' day! I would like to join u the next time u throw such balloon fest. Just let me know when n where. hi daphne, well done and i am sure many people will appreciate it. unfortunately i am afraid of balloons , which you might laugh bcoz i had a really bad experience in the past! Thanks for coming by...I think it is pretty accurate if I say that children generally love balloons, and so do some adults! OMG~! What a great experience you have with the kids ~ i wish i could do the same too.. hey, tell you what, i'd looovee to join your next ballon day/fiest/whatever u call 'em! loL! And of coz, with great honour i'll contribute some of the budgets! after all, the more the marrier, isnt it?! p/s: first time to your blog ~ sure i'll read more.. lol! hi daphne, its been great reading your blog and i'm hoping to join you in your next balloon fest! its a wonderful idea and well done the both of you!